And just like that, we’re already in February! Did y’all watch the game last night? I caught bits and pieces but always watch the half-time show and thought it was great! Love Missy Elliott- her songs take me back to the 90s, even though those songs she sang were from early 2000s. And they’re still on my iPod!So, this month we celebrate l-o-v-e and it also happens to be the month I turn 40!! That must be why I remember the 90s like they were only 10 years ago. 😉 Valentine’s day comes first (in less than 2 weeks! ), so let me share some Valentine’s crafts and gifts I played around with over the weekend. Dang, I hope 40 isn’t too old to still be playing with crafts because I don’t have any plans to slow down. My philosophy for Valentine’s day is to make it special for everyone, not necessarily only a romantic holiday. I like to shower my son and girlfriends with affection too. 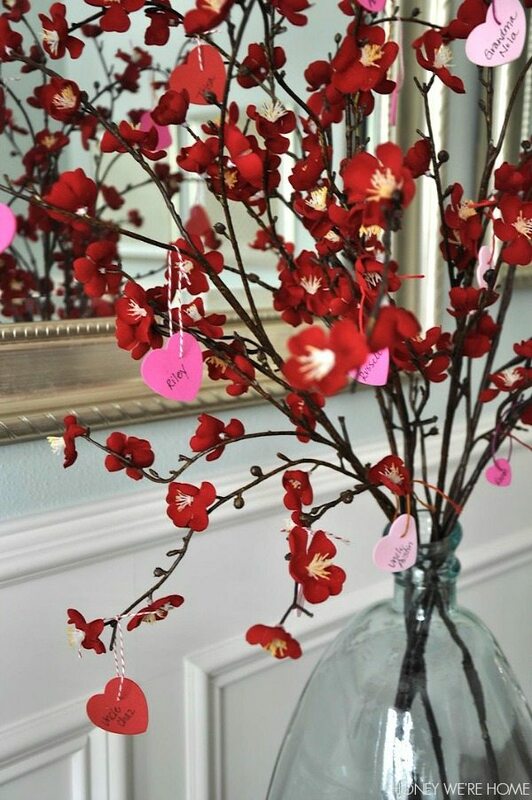 This year, we made a ‘love tree’ to recognize some of the important people in our life. 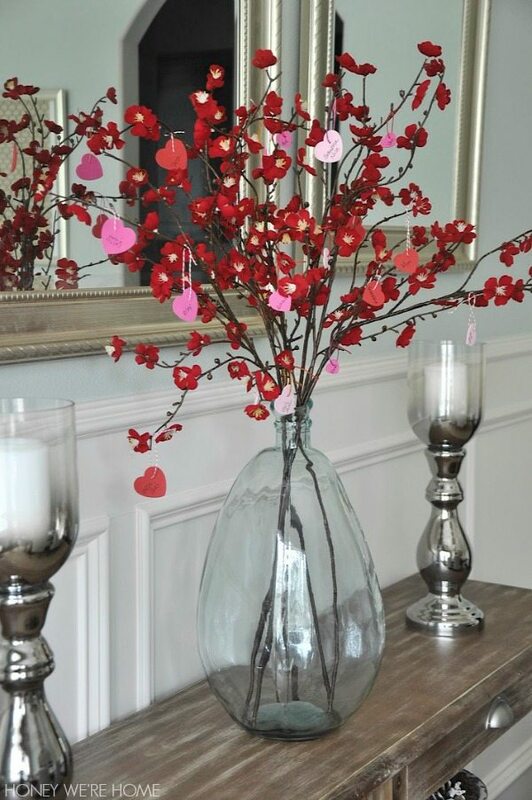 We wrote their names on a foam heart, and hung them from the branches of this display in our dining room. I’m crazy for the flowering branches and vases at World Market (they are the prettiest and best priced I’ve seen) and grabbed the red velvet plum blossoms to decorate our dining room. I wanted these at Christmas, but Valentine’s day will do, then I can pull them back out next December when red is hot again. You could also make a tree for just one person and, using bigger hearts, write things you love and appreciate about that person. Would be so cute for a teacher gift too. 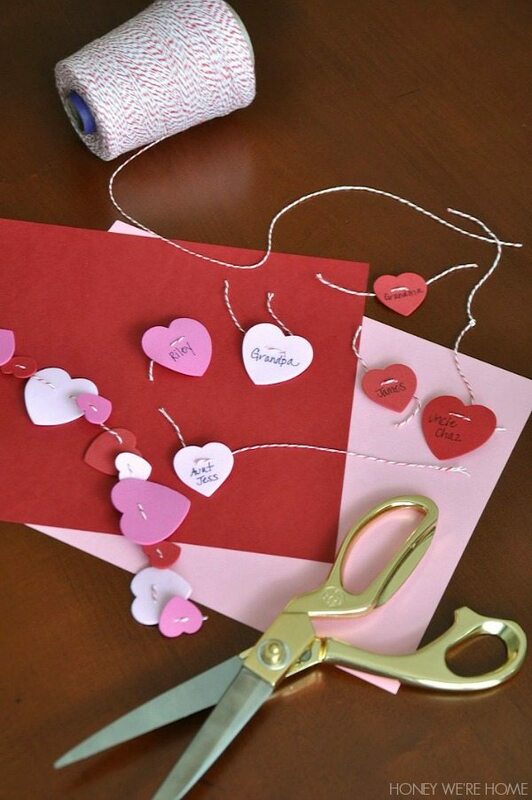 Each child puts their name on one heart, then, on the flip side, tells their favorite thing about the teacher. I’ve got teacher gifts on my brain because we just celebrated James’ teacher last Friday. I’m kinda crazy over this next DIY idea. Using the scented rose soap petal set, I made a decorative ball that smells so good, but in a gentle way, not too overpowering. I used light pink, but they come in other colors too- the multicolored set is especially pretty! You’d probably want to use a foam ball as your base, but I didn’t have one on hand, so I improved with a ball-shaped vase filler. 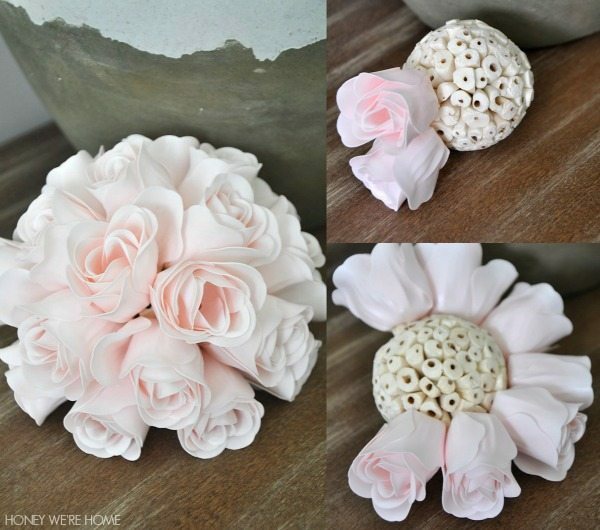 I used a sewing pin to affix each rose to the ball and left the bottom empty so the ball could sit flat. This ball below was made with 20 roses, exactly one box. This ball turned out so beautiful and delicate that I want to keep it out way past V-day. I’ll probably move it to my desktop so I can enjoy it while I’m working. And it won’t wilt! 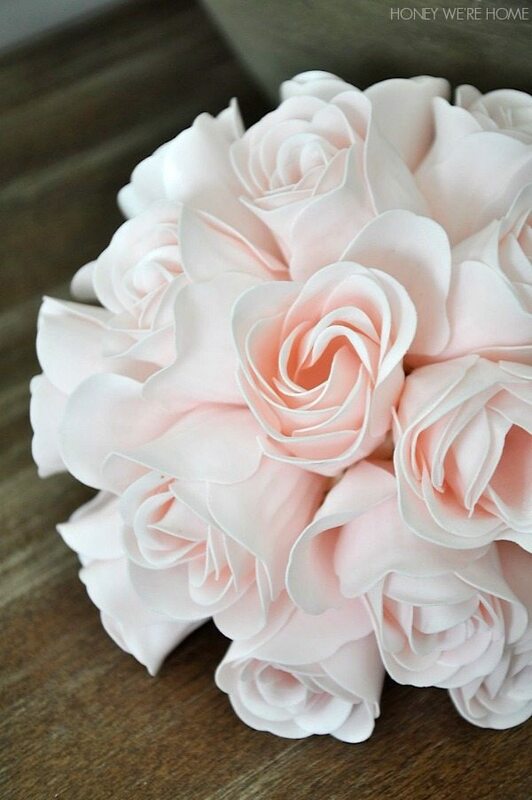 A heart-shaped rose petal wreath would be cute for Valentine’s day too. Of course I tend to think of that heart-shaped box of chocolates as a traditional Valentine’s day gift- it’s what my Dad always bought for me and my mom when I was growing up, but I try to think of what my friends would appreciate as a gift nowadays. 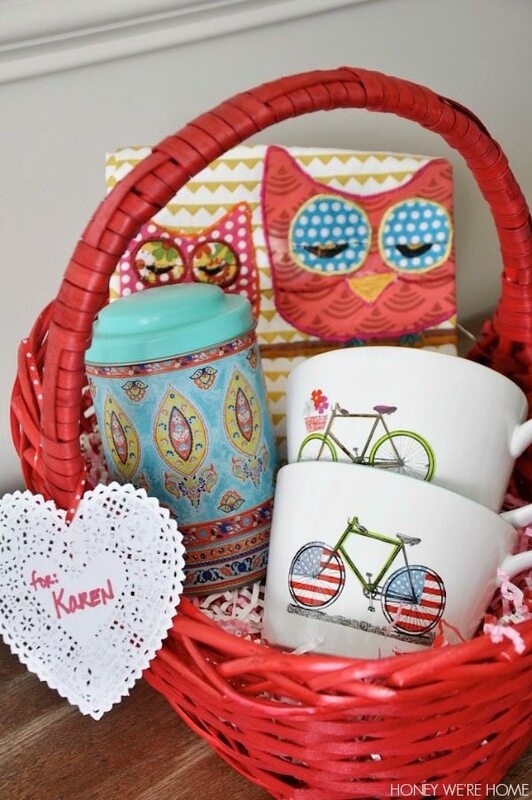 This ‘tea gift basket’ filled with two bicycle mugs (I couldn’t decide! ), a decorative tin filled with tea bags, and the cutest owl tea towel makes a sweet present for my girlfriend who loves her morning and afternoon tea. The ‘his & her‘ mugs are adorable too, or the zodiac mugs, but I loved the inside of the bicycle cups because they are brightly colored. 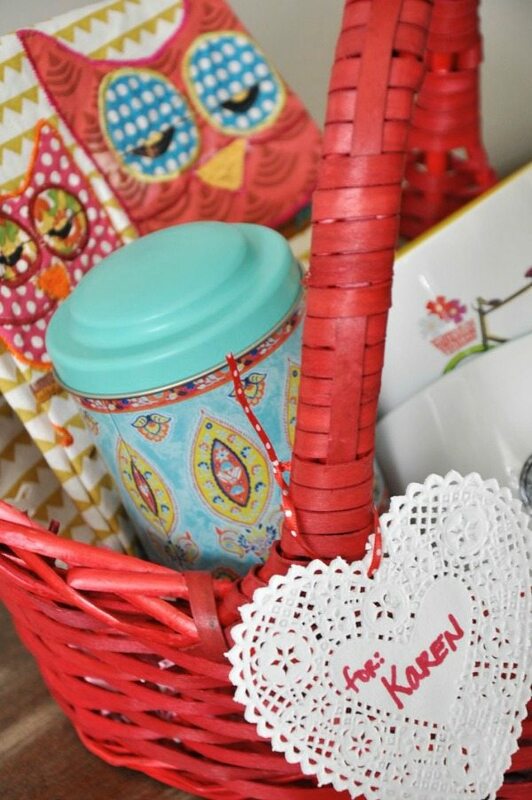 I used a heart shaped doily as the gift tag and tied it around the red gift basket with a skinny red dot ribbon. This basket comes with filler and a cellophane bag to enclose the gift in. You can’t go wrong with a bottle of wine as a gift, right?! Well, for most people anyway. 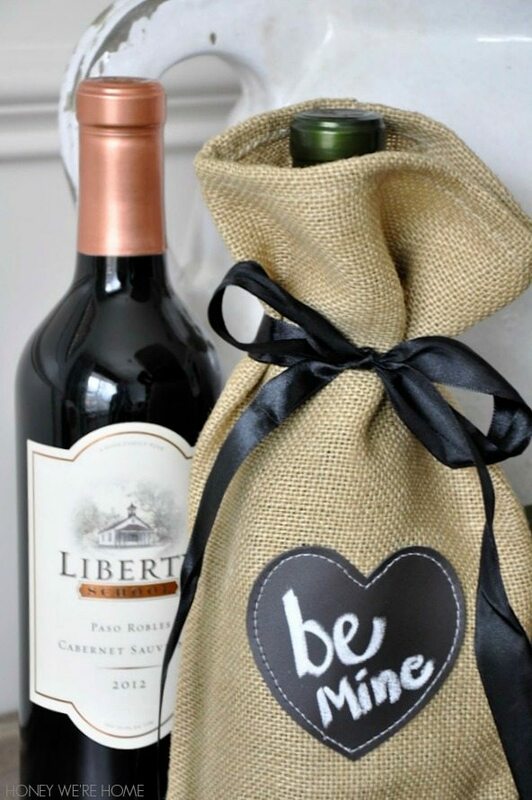 This jute wine bag with chalk label makes it extra special. Makes me want to gift this bottle of wine right away! I’m the worst when it comes to keeping a gift until the special day- I always want to give it immediately. As for the actual day, we don’t have any plans yet, but maybe we’ll do a Valentine’s/Birthday celebration combo and go out to a nice dinner. Since we’ve been on a pretty strict meal plan lately, a good meal out is always a treat. How do you like to celebrate? A small acknowledgement of love is all we really want, right?! If you’re in the mood to pick out a little something for a friend (or yourself:), use discount code SAVEBIG10 at World Market for 10% off your purchase until February 5. 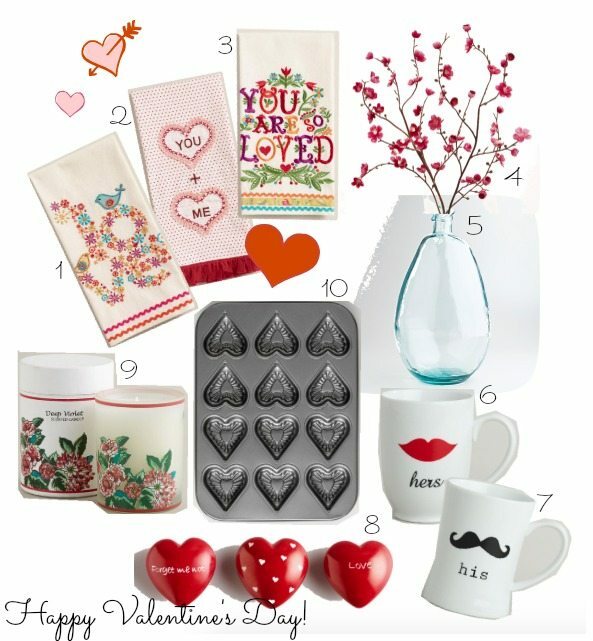 Thanks to World Market for partnering with Honey We’re Home on this post and for making Valentine’s Day sweeter! Affiliate links used. Happy early Birthday to you! I love all these fun Valentine gift ideas. 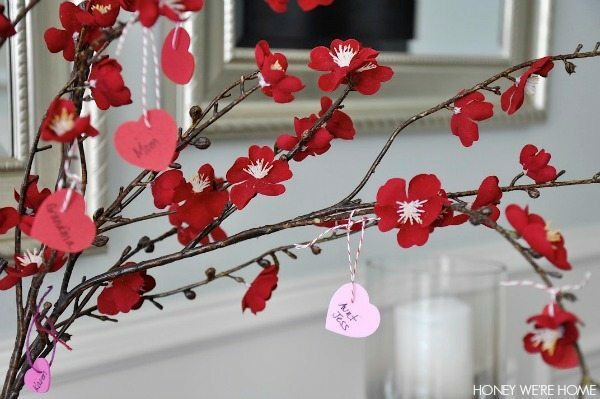 My favorite is the flowering tree branches, what a lovely way to recognize all the loved ones in your life. These are great ideas, I always love giving gifts & I'm so much like you-as soon as I have the gift together I want to give it to that person right away! That rose ball is my favorite! And happy early birthday to you! I am here to say, no, 40 is not too old to be crafting. Ha, my Granny crafted well into her 70s-80s!! Love how the rose ball turned out. Amazing post for Valentine day! 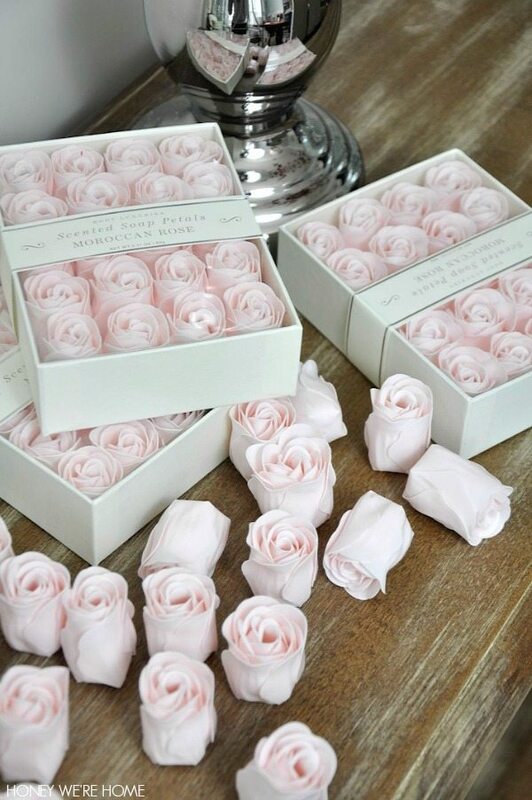 So so love that rose ball. And I have that exact ball already. Headed to World Market. Thanks for the darling idea, friend. Such great, great ideas!! WM is one of my faves…you can always find goodies there! I love all of these ideas! I could just live in World Market. Too bad I didn't find this post before V-day, but I pinned it for future reference!